This is where Shyamalan succeeds where so many others have failed. He’s made a B-Movie with elegance and class that makes you think outside the box and keeps a high amount of suspense from start to finish. Sure, there are aspects to this film that are silly, over-the-top, and downright laughable at times, but it is more of a nervous, uneasy laugh, as we see where Shyamalan takes us. 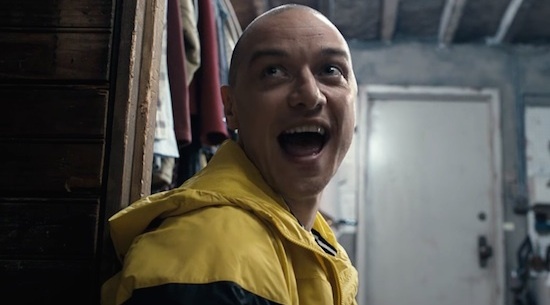 The film is simple enough, as we see three teenage girls kidnapped, (the main one being Anya Taylor-Joy from ‘The Witch‘),and brought to an underground basement somewhere by the likes of a man with split personality (James McAvoy), or shall I say 24 different personalities. We don’t know why he has taken these three girls really, but he does reveal some sinister clues as to perhaps why they were chosen. His different personalities range from manly scholars, to endearing women, to an 8-year old kid, to artsy yuppies, and more. And McAvoy plays each of them perfectly, as he mixes their personalities with a certain kind of gentle yet horrifying way. As time passes, we see each split personality give clues as of what’s to come, yet the burn and suspense is so high that you will be on the edge of your seat through the whole film with sweat pouring down your forehead. Shyamalan is not afraid to go to some certain dark places here either, as we see in some flashback sequences, and I applaud him for that, even more so for keeping the film with a PG-13 rating, but still managing to show enough to get the point across. Again, there are some fairly silly moments here, but they do serve a purpose in the overall story that makes this one big success for Shyamalan. Now for the moment of Shyamalan’s calling card – a twist ending. Well folks, there isn’t one. You read that right. There isn’t one. It’s a straight and narrow approach, but an effective approach. ‘Split‘ is a very suspenseful B-Movie that achieves its goal from square one, which is to entertain and put you on edge, and keep you guessing until the very end. Shyamalan has sure found his calling card in the third act of his career and I hope he sticks with it. This entry was posted on Wednesday, January 18th, 2017 at 12:03 pm	and is filed under Film, News. You can follow any responses to this entry through the RSS 2.0 feed. You can skip to the end and leave a response. Pinging is currently not allowed. « And Cue the ‘White Men Can’t Jump’ Remake!